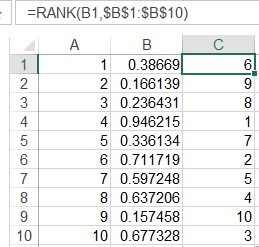 This tutorial explains how to use Excel Rank Function to give a number a rank in a range of number. Order Optional. A number specifying how to rank number. If order is 0 (zero) or omitted, Microsoft Excel ranks number as if ref were a list sorted in descending order. If order is any nonzero value, Microsoft Excel ranks number as if ref were a list sorted in ascending order. Note that if the two numbers to be ranked are the same, then the rank of the two numbers are the same, and the next rank will be skipped. For example, if values of A1 and A2 are 1, then in the ascending ranking, both A1 and A2 rank 1, but A3 will rank 3 instead of rank 2. You may use Rand() Function in column B and then assign unique number in column C using Rank Function. I have a blog post for RANK in subgroup. Hope you and your reader like it.